The rise of China's space program may pose a potentially serious military threat to the United States down the road, top American intelligence officials contend. China continues to develop technology designed to destroy or disable satellites, which makes the United States and other nations with considerable on-orbit assets nervous. Even Beijing's ambitious human spaceflight plans are cause for some concern, since most space-technology advances could have military applications, officials say. "The space program, including ostensible civil projects, supports China's growing ability to deny or degrade the space assets of potential adversaries and enhances China's conventional military capabilities," Army Lt. Gen. Ronald Burgess, director of the Defense Intelligence Agency, wrote in testimony presented before the U.S. Senate's Armed Services Committee Feb. 16. Burgess was delivering the DIA's annual assessment of threats to U.S. security and interests around the globe. China has made no secret of its ambitious space goals. In 2003, it became the third nation — after the United States and the Soviet Union — to independently launch a person into orbit. This past December, China joined the United States and Russia as the only nations with operational homegrown satellite navigation systems. China's Beidou system — whose name translates as "Big Dipper" — is somewhat rudimentary at the moment, consisting of just 10 satellites and covering a swath of the Asia-Pacific region from Australia in the south to Russia in the north. However, China envisions a global system with 35 satellites by 2020. The emergence of Beidou should eventually make China far less dependent on the GPS constellation, which is operated by the United States military and is currently the world's dominant satnav network. Beidou "will enable subscribers outside of China to purchase receivers and services that give civilian and military applications greater redundancy and independence in a conflict scenario that employs space assets," Burgess wrote. China operates many other satellites, for research, weather monitoring, communications and reconnaissance purposes. But it's tough to know exactly what the nation is getting out of these spacecraft, even the seemingly innocuous ones, according to Burgess. "Beijing rarely acknowledges direct military applications of its space program and refers to nearly all satellite launches as scientific or civil in nature," Burgess wrote. While the United States has at least nominally separate civil and military space programs, China's space activities are driven almost entirely by the People's Liberation Army, experts say. 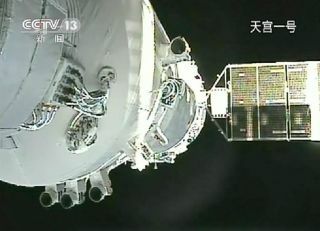 China is developing some space technology with indisputably military applications. In January 2007, the nation shot down one of its own weather satellites with a missile, spawning thousands of new pieces of space junk. The test drew strong criticism from the United States and other countries. But China has continued to develop its anti-satellite (ASAT) capabilities in the years since, aided by advances across various sectors of its space program, according to Burgess. The United States has long enjoyed playing a dominant role in space, giving the nation the "ultimate high ground" in military conflicts for decades, experts say. ASAT capabilities — whether they're developed by China or other nations — represent a genuine threat to this dominance, Burgess and other analysts contend. "From the counter-space perspective, Russia and China continue developing systems and technologies that can interfere with or disable vital U.S. space-based navigation, communication, and intelligence collection satellites," Burgess wrote. Burgess' testimony should come as no surprise, some analysts say, since the U.S. military has had its eye on China's space progress for quite some time. "There's nothing new in this testimony as far as China is concerned," said Brian Weeden, a technical adviser with the Secure World Foundation and a former orbital analyst with the U.S. Air Force. "We know what they're doing. They're on almost exactly the same development path as both the United States and the Soviet Union used when they first started their space programs." Weeden pointed out that the new DIA assessment deals only with China's space capabilities, not the likelihood that Beijing would deploy them against U.S. assets anytime soon. "My guess is that the more detailed analysis — of just how threatening the capabilities are, what the likelihood is, what the intentions are and how much of an impact they could have on what the U.S. wants to do — that's, of course, all the classified bits," Weeden told SPACE.com. While China is indeed ramping up its space program, it's also important to keep in mind that the nation still trails the United States in most areas, from planetary exploration to space-based reconnaissance and navigation, he added. "As far as milestones and capabilities, I would say they're a couple of decades behind," Weeden said.